Hometown Hockey Barrie Highlights. - Very Barrie Colts | A website covering the Barrie Colts of the OHL. Home Barrie Barrie Colts blog Bryan Little Hometown Hockey Mark Scheifele Rogers Winnipeg Jets Hometown Hockey Barrie Highlights. 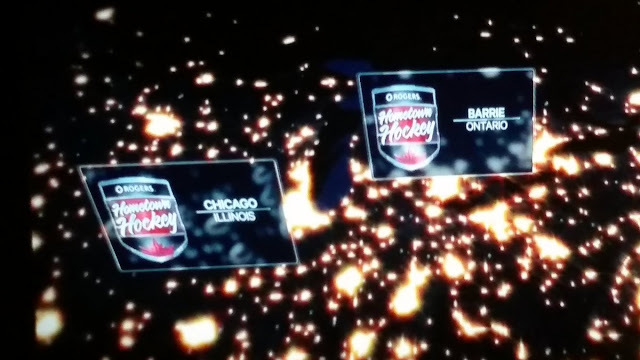 Maybe you were in attendance during the filming of Hometown Hockey over the weekend or maybe you just want to relive it. There were so many great memories and some excellent features over the weekend. My favourite part was a feature on the broadcast side of things, they had a great segment on Mark Scheifele where they discussed his career, his time with the Colts and how his former coach, Dale Hawerchuk helped his game. Here it is if you missed it. The Mayor even was able to get a great picture with Ron MacLean. Here is a shot of Cordell James and Anthony Stefano on the broadcast. Luckily most the team managed to make it and got some love. Not only was the broadcast from Barrie but the first goal of the game was scored by a guy who played in Barrie. Former Barrie Colt, Bryan Little opened up the scoring for the Winnipeg Jets. Just a small taste of an incredible weekend! Thank you to the Hometown Hockey people for making a special weekend for us here in Barrie and thank you for showing everyone else that we are a great hockey town! Did you attend? Please share your favourite memories and pictures in the comments!